Brexit is causing a crisis in British politics but the values split which it revealed could affect many other countries, particularly post-industrial democracies. Those countries experienced what Ron Inglehart called the ‘Silent Revolution’ of progressive values in the 1960s and 1970s, which became part of a mainstream consensus. However they are now susceptible to counter-revolutions such as Brexit, the rise of authoritarian populism and ‘anti progressive’ protest movements such as the Yellow Vests. These changes raise serious questions for politics but also for the model of ‘progressive’ campaigning which has become conventional since the 1970s. The change model: for change to have sufficient legitimacy to last, it must respect values diversity. By this I mean that it must be endorsed through adoption in all the main values groups of society (Pioneer, Prospector and Settler), on their own terms. Values-bombing (eg PCness) does not do this. Progressives should design and invest in campaigns to engage people unlike themselves and avoid the default mobilisation of their fundraising base as the way to win campaigns. Politicians, governments and campaigners must work actively to maintain the ‘social elastic’ of common experiences, inter-dependencies and behaviours with cross-values appeal to prevent society dividing into disconnected values silos, not just online but in real life. The immediate British crisis over Brexit (March 2019) hinges on how to implement the results of the 2016 referendum on membership of the EU. 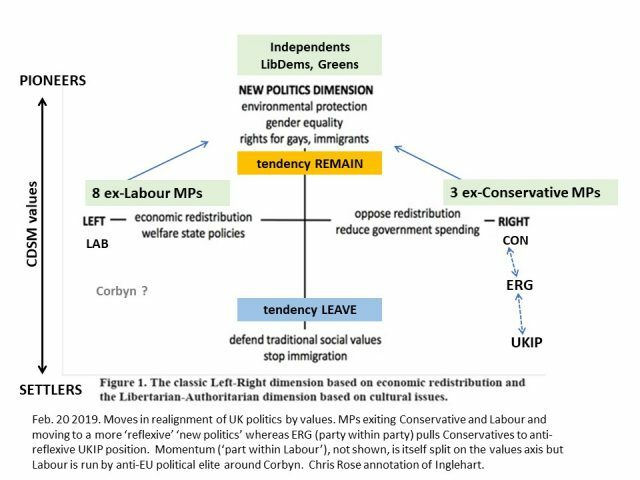 As explored in Brexit Values Story Part 1 and Part 2.1, the vote split the country on values lines but in so doing, it has also split the two main political parties, Conservative and Labour, into ‘Leave’ and ‘Remain’ camps. As Leave-Remain public opinion is ranged not along a left-right axis but a values axis from Settler to Pioneer, or in Ingleharts terms from Authoritarian/ materialist to New Politics (post-materialist), this has also split the main parties, and that has disabled and destabilised Westminster politics, leading to a slow-motion political car crash of epic proportions. One reason Britain’s negotiation with the EU has been so agonizing is that political choices have separated as values choices but both Theresa May (Conservative) and Jeremy Corbyn (Labour) have tried to suppress this reality as they prioritize keeping their parties intact. As I described in the February blog Britain Is Undergoing A Values Realignment, defections from the main parties have led to the emergence of one new political grouping: the TIG The Independent Group, now a nascent political party to be called ‘ChangeUK’, in the same Pioneer values territory as the Liberal Democrats and Greens (and most Labour voters). At the opposite pole, UKIP is now joined by the ‘Brexit Party’, and their values are similar those of the Ulster DUP which May has depended upon for a working majority, and the ERG or European Research Group. The latter are regarded as a party-within-a-party at the extreme right of the Conservatives. This realignment process is not finished yet and will occupy the attention of political media but the underlying values dynamics are more important for the future of campaigns. Public opinion in both Britain and most of Europe has swung to be more not less pro-EU since the UK Referendum (probably out of horror at the consequences of Brexit and counting the benefits of EU membership) but the underlying pattern of pro- and anti-EU sentiment that was revealed by pre-referendum surveys and confirmed in the vote, is also found in some other European countries. 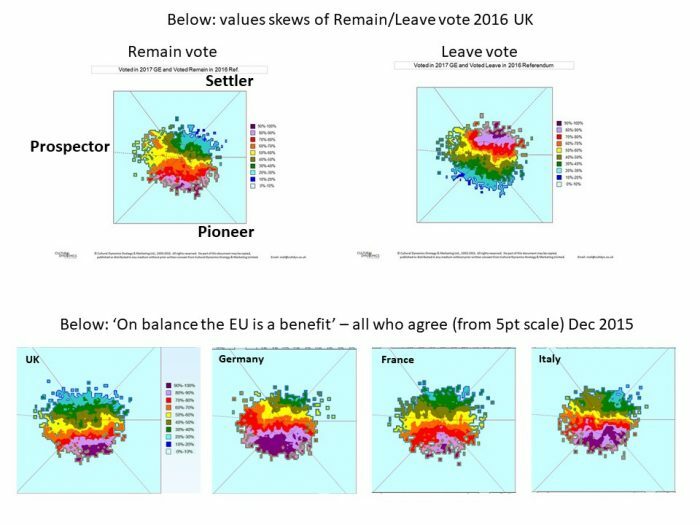 The UK values split over Europe disproportionately pitched Pioneers and Now People Prospectors against Golden Dreamers and Settlers thus splitting the values map across the middle (see explanation in Brexit Values Story Part 1 with the voting data in Brexit Values Story Part 2.1). This was evident as a social values cleavage in other EU Member States such as Italy, France (yellow vests, Front National) and Germany (AfD) before Brexit. It’s just not been activated in the same way in those countries (and doesn’t by the way apply in Spain). Campaigners are used to thinking of themselves as the ‘insurgents’. They forged effective strategies on this basis in the mass media age of the 1960s – 1980s. Their role was to be non-governmental organisations, pressuring and showing the way. Government would then deliver and politicians would do the necessary politics to embed and secure change. As most campaigners are Pioneers, they also have the highest sense of self-agency and are most comfortable with risking controversy or failure, allowing them to also be innovators. So although todays long-established campaign groups truly were innovators and insurgents back in the 1970s, today their values group may still be the social innovators but they are politically no longer the insurgents. This is because the ‘values pyramid’ as deduced by Abraham Maslow in the 1950s, has been turned upside down. 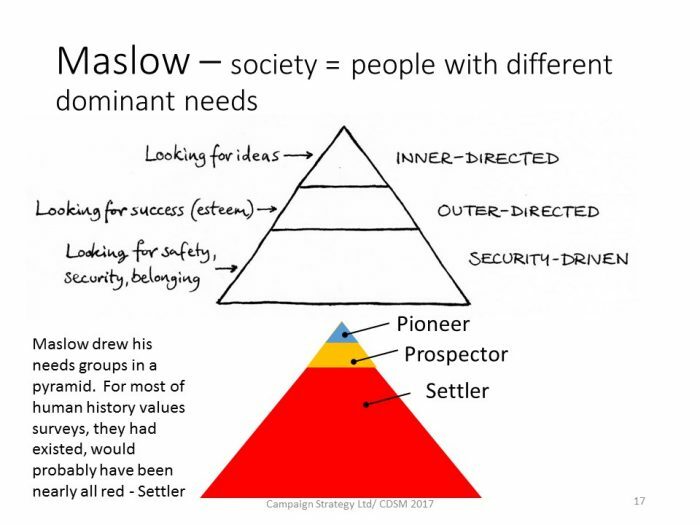 Society as it was deduced by Abraham Maslow (top) and probably was for millennia (bottom) – the ‘pyramid’ of the three main values-needs groups. When most of society was security-driven (Settler) it had inbuilt social ballast, ‘tribal’ loyalties, relatively predictable behaviours and deference to authority. The inversion of the ‘pyramid’ of values groups as measured by CDSM between 1973 and 2016. 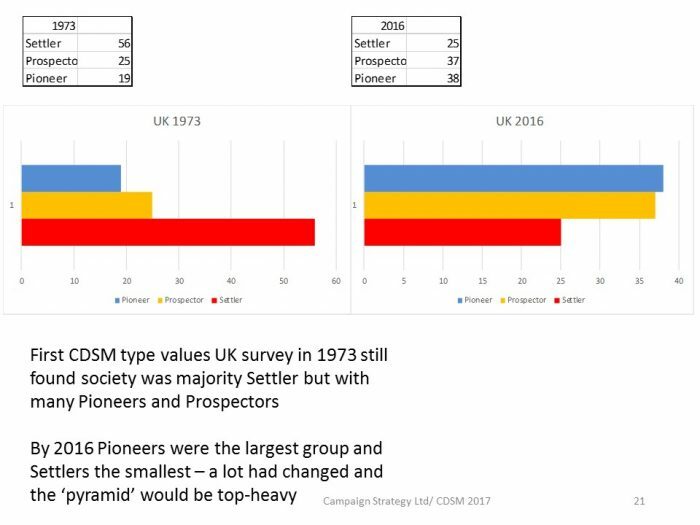 (Slides from Brexit Values Story Part 1) In the UK Pioneers went from the smallest to the largest group and their ideas from fringe to mainstream. Settlers felt an increasingly marginalised minority. The proportion of Pioneers is even higher in some other developed countries (eg Australia, Germany and the US). This inversion happened through the natural values dynamic of people transitioning from one dominant values set to another if they meet their needs for safety, security, identity and then esteem of others and self esteem. 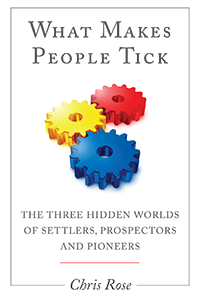 In the ‘good times’ of improving real prospects, better social and economic conditions and greater opportunities, these ‘intergenerational’ changes as Inglehart calls them, or the ‘values conveyor’ as CDSM term it, led to more people meeting their security needs and esteem needs, with the result that by 2016 far more had become Prospectors or Pioneers than in the 1970s. 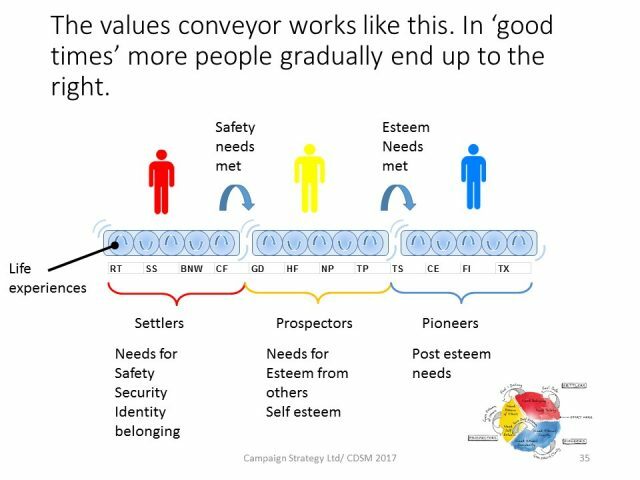 Most change-campaigns across the world are dominated by Pioneers (the values mechanisms of how this happens are detailed in this blog on the ‘Usual Suspects’). As a group, Pioneers were always in the vanguard of change but now, even if not in themselves an outright majority, they are often the largest values group in developed democracies. Furthermore, many of their ideas have been consolidated in a mainstream consensus. If they are joined, as they often are, by the Now People Prospectors, they are even more likely to form an outright majority. This raises the question of what change strategies such groups should adopt today. The insurgent positioning is a piece of cultural baggage which may not be optimal if you are representing the mainstream. At the very least, if you do not bother to win the support of smaller values groups very unlike you, it makes you vulnerable to being perceived as part of a disinterested establishment. As the largest values group, Pioneers are sometimes capable of exerting a values-hegemony: they may have the power to project their values at others, manifest as Political Correctness, which in values terms is a sort of ethical force-projection or ‘values bombing’. Resentment of PCness was a strong predictor of voting for Trump in the US and in the UK the equivalent was rejection of ‘isms’ like feminism and environmentalism amongst Leave voters. 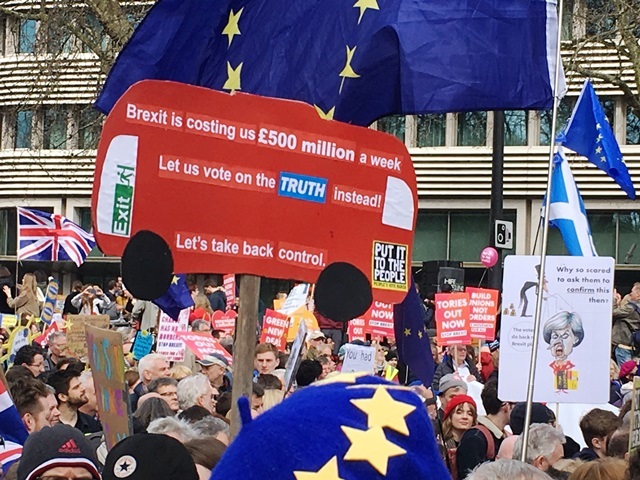 Some of the strategies and tactics of campaign and cause groups – and ‘progressive movements’ – may have themselves contributed to values-polarisation, although compared to the effects of job insecurity and immigration identified by Inglehart, their precipitating contribution to Brexit would have been marginal (see Political Correctness, Brexit, Trump and Campaigns). 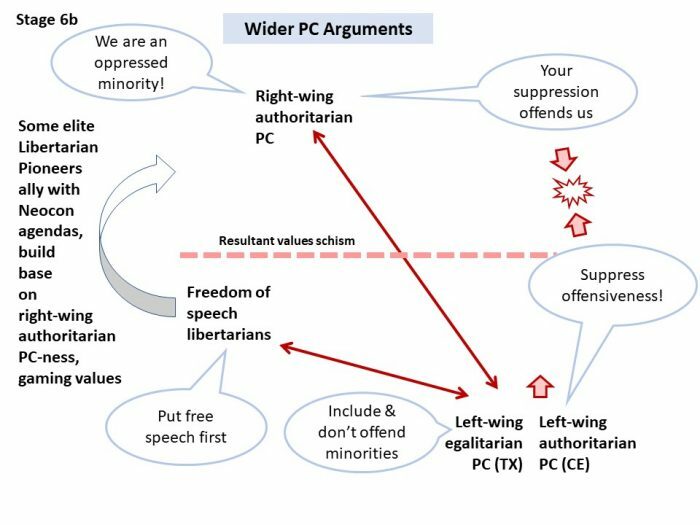 End stage from A Possible History of Political Correctness in Values Terms – opposition to PCness in the US was a powerful predictor of voting Trump while in the UK the equivalent for Leave was opposition to ‘isms’s such as multiculturalism, feminism, environmentalism. A great deal of effective campaigning depends upon having natural justice onside. It hardly needs saying that many of the opponents of progressive causes plainly do not. For example the fossil fuel industry continues to exploit its entrenched financial influence over politics – especially but only in the United States – to enable to it continue doing incalculable damage. But as ‘progressive’ groups gain greater mainstream influence, directly or indirectly, they need to engage more not just in pointing to desirable destinations but in the delivery of sustainable change. This means securing a mandate for change from all the main values groups. 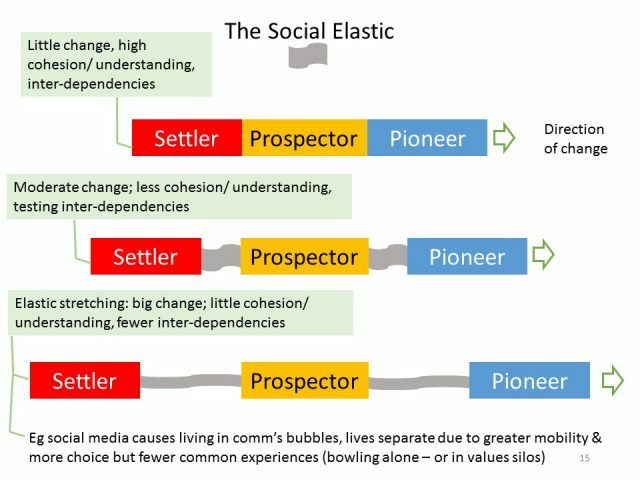 The natural human dynamic for the sustainable spread of change across values groups, requires its voluntary adoption, by emulation from Pioneers to Prospectors, and then by norming from Prospectors to Settlers. 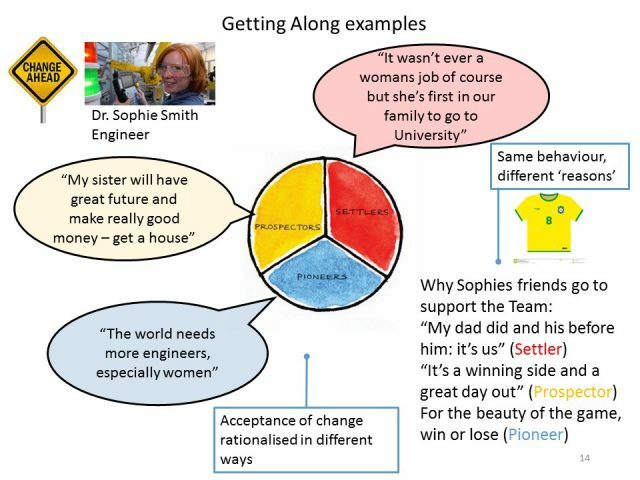 This requires more work than simply generating support from within the 38% [UK] of Pioneers but achieving it means values endorsement, the opposite of a values split. The first step requires the behaviour (or idea) to appear successful to Prospectors. The second step requires it to appear ‘normal’ to Settlers (sufficiently familiar and widely adopted). This has to be on people’s own terms, which requires respecting their values (to be successful and to be normal, respectively), and not trying to project Pioneer values onto them (Political Correctness). It’s about strategic enabling of behaviour change, not ‘changing minds’ or imposing values. It means accepting that people may do the same thing, for different reasons. Resorting to projecting your own reasons and calling on others to adopt them, is usually motivated by a desire to get change to happen quickly fast but rather than catalysing change, Pioneer projection at Settlers or Prospectors tends to act as a blocker, like a catalytic poison deactivating change. If forced upon people, it can cause a backlash of active rejection. Although the natural change dynamic can happen quite quickly (as with consumer goods and styles) it may appear ‘too slow’ for campaigners dealing with ‘urgent issues’. It’s attractive then to find ways to produce significant outcomes without involving the voluntary social spread of ideas or behaviours. The problem with this is that if the changes are vulnerable to reversal, they have no supportive ‘constituency’ to defend them, and there is no more entrenched form of approval than one embedded by daily participation or familiar behaviour, because we all tend to rationalise and defend our behaviours as ‘making sense’ (Track 1). This is also why if something is adopted through individual choice without us being made aware that it’s something others think we ought to do, it is likely to spread more efficiently. The main mechanism for doing this is often the market in products and services. The spread of rooftop solar pv in the UK followed just this pattern, albeit a decade after Germany. From the 1970s until the 1990s solar pv in Britain was confined to Pioneer projects and campaign demonstrations (eg Greenpeace 1997 x2, above). 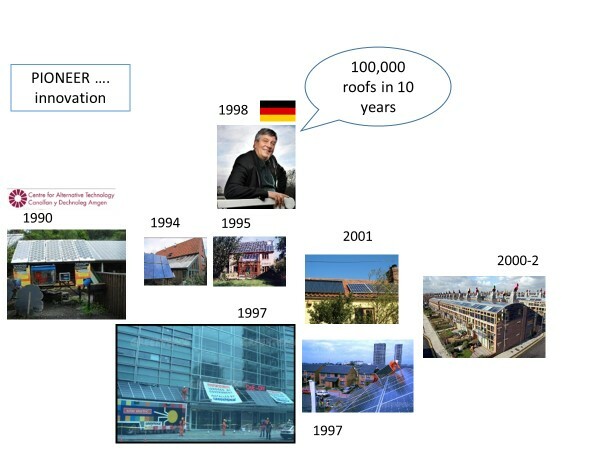 By the late 1990s experimentally minded green architects were putting in larger solar pv installations (eg BedZed 2000), inspired by the German example led by politician Herman Scheer. In 2001 (yellow building) our house was the first with solar pv and thermal in our town – which led to curious locals knocking on our door to ask if it worked. UK Feed in Tariffs did not come in until 2010, so at this time the householder motivation to use solar in the UK was ‘ethical’. Over the next decade solar pv became aspirational. Prospectors started to get it along with Pioneers. 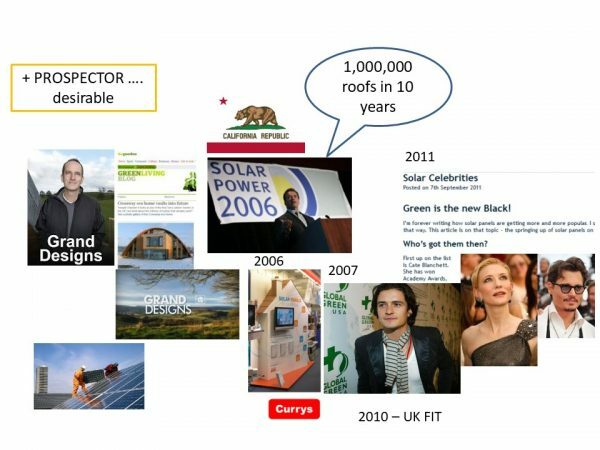 A major influence in the UK was a tv programme ‘Grand Designs’ which featured many ‘dream’ homes with solar. The out-take was ‘rich successful people are doing this’. In 2006 Arnie Schwarzenegger, Governor of California launched a million solar roofs programme. Green minded celebrities installed it, providing fashionable endorsement. Mainstream brands like Curry’s appeared with domestic solar at the Ideal Home Exhibition. By the 2010s solar pv was no longer novel but becoming normal. Conservative UK Settler brands like Anglia Windows offered it. 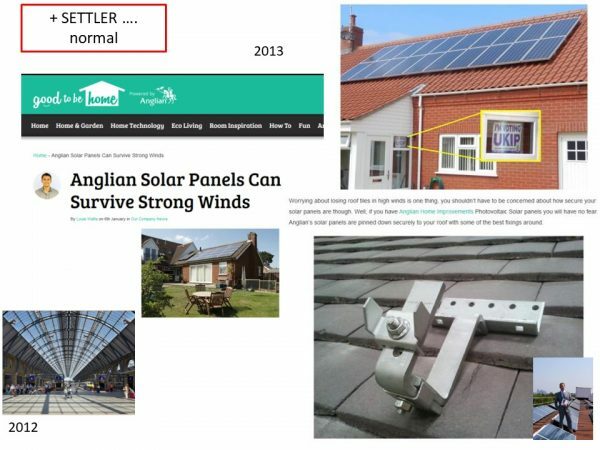 In this case the selling point was not ethical climate-saving but the risk-avoiding strength of the brackets fixing it to the roof, in case of extreme weather. 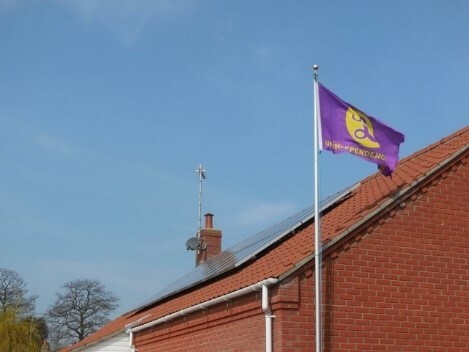 Around the corner from my house, a UKIP voter (sometimes he flies a UKIP flag – UKIP’s base is Settler) put in a large solar pv installation. Normalisation: he assured me it would pay for his pension. This process of Pioneer innovation, success-bridging to the (Now People) Prospectors through emulation, and eventual norming and uptake by Settlers, is the usual way new things spread across society, if they are going to. Key to the contagion is that people adopt it for their own reasons (values). Had Prospectors been told by Pioneers that they were wrong bad people not to have solar pv, their answer would probably have been “get lost”. Had Prospectors told Settlers they should get it to be fashionable, the response might have been similar. Settlers are not smitten by fashion. 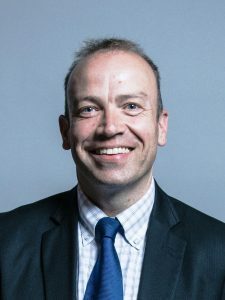 Had it become a politically charged ‘wedge issue’ (which in the UK has happened with onshore wind power when the Conservatives dropped it and adopted UKIP style anti-wind policy, distancing themselves from their Liberal Democrat coalition partners), it would not have spread so effectively. A campaign of ethical values projection could have stymied the spread of solar pv in the UK outside of the Pioneers. Had solar not ended up on the rooftops of so many Conservative and even UKIP voters, it might have experienced the same fate as onshore wind. Although the two are different in that small scale solar is less visible than a large wind turbine, onshore wind could become a values-hate-symbol in England partly because local individuals were not ‘bought into it’ in the same way as communities were in countries such as Germany and Denmark where there was a high degree of community ownership. It just appeared in their area, they had no personal connection and there was no way for local residents to make a positive connection. This meant there was no local human constituency endorsing and identifying with wind, making it easier to ‘other’ as an alien presence, and to dislike. At least in England, at local level it is having to oppose a person which often stops potential activists doing anything about an activity that really troubles them: for example, hating to see farmers flailing hedgerows but not wanting to confront any individual farmer. A UK example with practical consequences for climate campaigners, is the setback to greening Britain’s economy and tackling climate change, caused by the abandonment of its premier source of renewable energy: onshore wind. Until 2012 onshore wind (the cheapest form of new renewable electricity and now the cheapest of any form) was promoted by all UK governments. The only party to oppose it was UKIP, for whom it was one of three values-signature policies (the other two being opposition to immigration and withdrawal from the EU). Then a campaign organised by right-wing Conservative politician Chris Heaton-Harris, Chair of the ERG, forced Prime Minister David Cameron to kill off onshore wind energy in England. With it went Cameron’s whole ‘reflexive’ project to green and modernize the Conservatives (and attract more Pioneers and Prospectors), begun in 2005. By 2015 the Conservatives had an anti-wind energy policy like that of UKIP, driven by competition between the two parties for the approval of a tiny, almost entirely Settler group of older right-wing voters, who were also climate-sceptic, euro-sceptic and against immigration. Opposing wind energy became a values-standard raised in the campaign to take Britain out of the European Union – with the Conservatives co-opted into UKIP’s ‘anti-reflexive’ counter revolution so that they could grab the standard and wave it themselves. Ultimately of course it all went wrong for Cameron. He threw wind energy overboard to please the Euro/climate-sceptic right, along with other concessions but he then lost the referendum and resigned. Britain is left with an energy policy which supposedly mandates the use of the most cost effective technologies to decarbonize its economy on the one hand, while simultaneously ruling them out on the other. It’s a mess although only a small satellite of the Brexit mess. 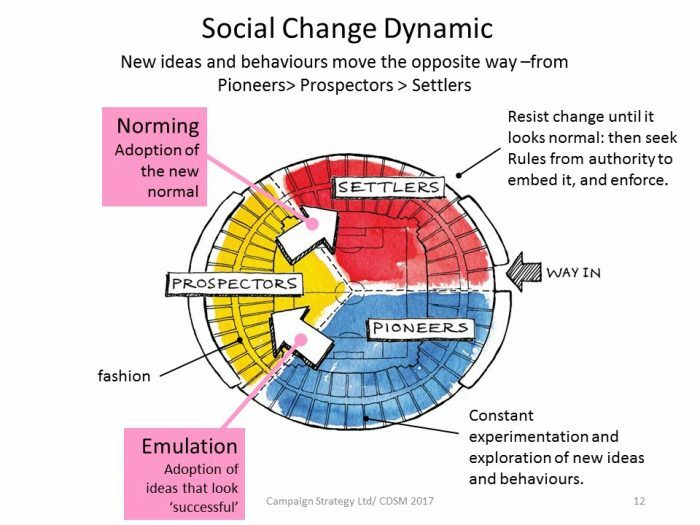 As discussed above, plan to introduce and embed change by using the natural values dynamic of Pioneer to Prospector by emulation (typically with Transcender Pioneers to Now People Prospectors as ‘the bridge’) and then Prospector to Settler, by norming. (In countries with a large Prospector population, such as many developing countries, the key change is often from Now People to Golden Dreamer, again by emulation). 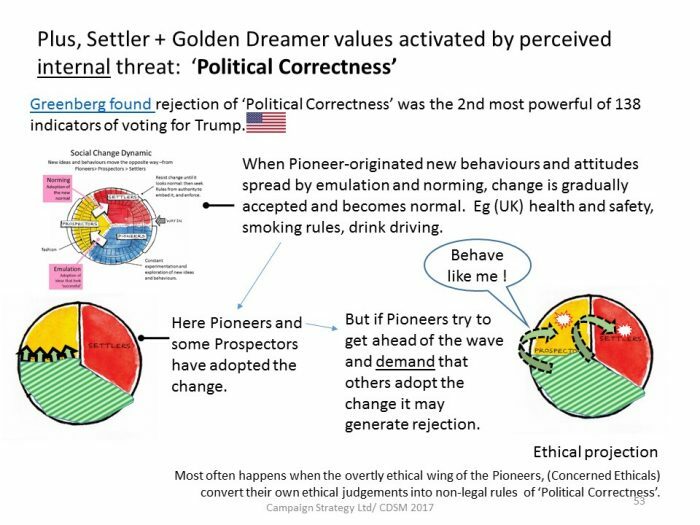 Do not try to speed this up by projecting Pioneer values at Prospectors or Settlers (including through admonishment in Political Correctness). That’s likely to be resented and to prompt values divides, as evidenced by research by Greenberg in the US (Trump election) and Ashcroft in the UK (EU Referendum). Enable people to adopt change for their own reasons, rather than trying to change the people. Our Values Modes result from our life experiences, not from a conscious choice or being told what our values should be. Afford values diversity in the same respect as you would to ethnic, cultural or other social diversity. Invest in Audiences Unlike Yourselves. Because campaigns often cannot be conducted without reaching a point where actors and followers ‘take sides’, the default should be to maximise engagement with unlike values and social groups. This is the opposite of just mobilising those who already most support your cause or organisation and of ‘identity politics’ campaigning. 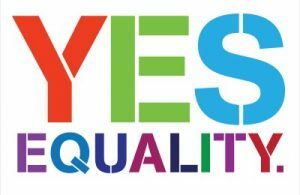 A good example of a winning referendum campaign on a potentially divisive issue which did this was the Irish Yes Equality campaign of 2015. That effort is unusually well documented in the book Ireland Says Yes by Gráinne Healy. 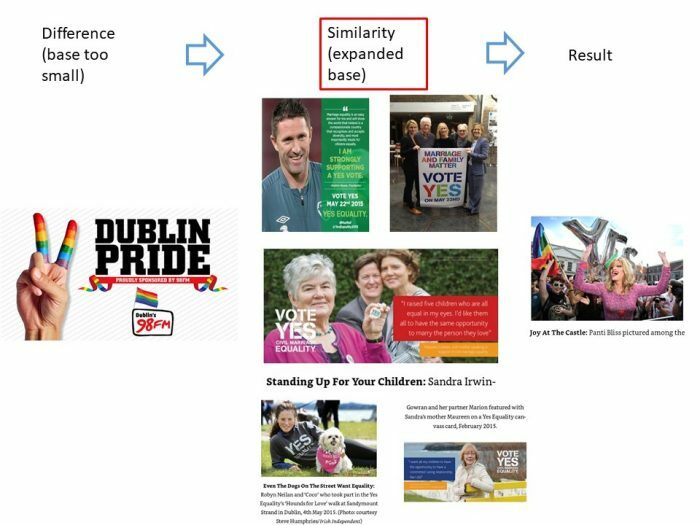 Every strategic step that campaign took had the effect of reducing rather than increasing difference between the ‘two sides’. The three greatest obstacles to this for campaign NGOs are all mundane. First, the reluctance of many campaigners to engage positively with anyone outside their base. Second, the default use of the fundraising base as the mobilisation base for campaigns, because it’s easy and cheap (and in the worst case, if a change campaign is instructed to raise money). Third, even where a campaign does actually do research into what might induce the disinterested or opposed to become supportive, it is of no value unless the results are acted upon (as Yes Equality did). Several studies have shown that since the ‘European Referendum’, being a ‘leaver’ or ‘remainer’ has become a stronger identity factor than being a supporter of one of the two main British political parties, Conservative and Labour. This is not so dramatic as it might sound. In reality politics was always way down the list of identity factors for people in the UK: ‘my political convictions’ ranked 27th of 31 options in a large 2014 survey, which may not have surprised anyone except some tribal political activists. Also in reality, smaller parties such as UKIP (strongly Settler) and the Liberal Democrats (strongly Pioneer) have always had more distinct values bases. 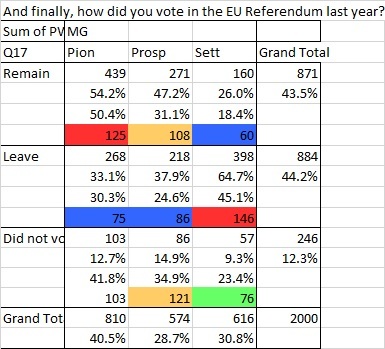 It also has to be borne in mind that not all Pioneers voted Remain (54% did), and not all Settlers voted Leave (65% did), and Prospectors were both the most divided and the least likely to have voted (15% didn’t). (Above: Table from Brexit Values Story 2.1 – see post for fuller explanation). But as is always the case, values differences were most pronounced amongst those with the strongest convictions, who most ‘make the weather’ in social issues and politics. Overall, the EU referendum and its aftermath have, so far at least, almost certainly increased rather than decreased perceptions of difference between values groups. Numerous pollsters suggest that views have tended to polarise, although there is now a consistent lead for ‘Remain’ of around 8%, which is why the Leave side doesn’t like the idea of a Second Referendum. Media imagery of course, promotes archetypes. 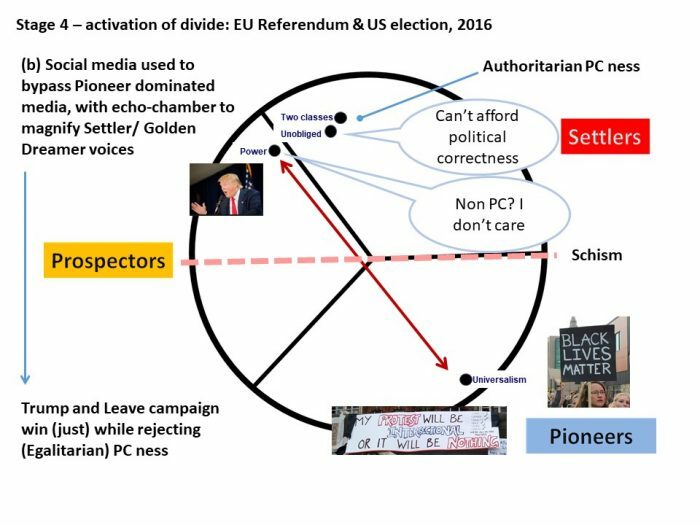 Many demonstrations and their online equivalents have led both sides into polarised self-parody: xenophobic angry nationalism amongst Settler/ Golden Dreamer Leavers, contrasting with smug, sneering disdain for Leavers from Pioneer Remainers. I believe that a lesson Government, politicians and NGOs should all take from this is that it is important promote cohesion between values groups, and maintain the ‘social elastic’ which keeps people with different values together or at least in contact. There is a considerable risk that if and when the country ‘calms down’, this will be forgotten, and with it many of those who were rightly or wrongly led into blaming the EU for their problems but who had very justifiable reasons to feel forgotten and unfairly treated by life. At a practical level, and nothing to do with the particulars of Britain and the EU, social bonds across values groups are created through real-life inter-dependencies and common experiences, such as reliance on public services (and in the UK, the NHS especially). Many of these are susceptible to public policy, for example by making public rather than private transport the best option for travel. Or by encouraging and celebrating activities with wide values resonance such as, in the UK, charity or community projects to benefit children, or caring for nature, or by promoting inter-generational connections, for instance within families, around the prospects of the next generation. Another practical risk faced by anyone trying to redress values divides will be to reach for social media as the quick and cheap option. Unfortunately the algorithmic online ecosystem and culture of most social media tends to create the exact opposite effect. Wifi-free and mobile network-free zones might have a beneficial effect! NGOs can catalyse or demonstrate such efforts but they should be a basic duty of governments, and achieving that in itself requires reaching across values differences in politics itself. Once the elastic snaps, trust disappears and society risks a descent into unpredictable cultural warfare. It’s no good expecting a good reading of philosophers, or economic tracts from Karl Marx, J M Keynes, Adam Smith or Thomas Pikkety to tell us how to tackle problems of values conflict. These are the condundra of ‘new politics’, and occur where psychological values, politics, cultural change and economics come together. In 1977 Ron Inglehart (of the University of Michigan and inventor of the World Values Survey) wrote a book about politics and values called The Silent Revolution. By “silent revolution” he meant the rise of progressive values. Or as the book blurb put it, ‘a gradual but fundamental change to political life throughout the Western world’ which included ‘a shift from an overwhelming emphasis on material values and physical security toward greater concern with the quality of life; and an increase in the political skills of Western publics that enables them to play a greater role in making important political decisions’. That describes the values-conveyor-effect of the post-war ‘good times’ described in Brexit Values Story Part 1, up to the 1970s. From then on, small-state Reagan-Thatcherism, neoliberal economics and globalisation started to reduce the real wealth and prospects of many workers and then of the economic ‘middle classes’, both in Britain and the US. The same has happened in some other first- generation industrial countries. This in turn began to trigger a push back from those who did not like the way that the system was changing. In their 2018 post-Brexit book, National Populism: The Revolt Against Liberal Democracy Roger Eatwell and Matthew Goodwin credit Pero Ignazi of Bologna University as being one of the first to notice a social and political backlash against the silent revolution. In 1992 Ignazi published The Silent Counter Revolution Hypotheses on the emergence of extreme right-wing parties in Europe [which is short and worth reading]. He charted the rise of Extreme Rightwing Parties or ERPs, most of which were not in the old fascist mould but a new breed with ‘a right-wing antisystem attitude’. Ignazi found that by the 1980s, European politics was increasingly volatile, old party ties were ‘decomposing’, voters were losing interest and parties were losing members, ‘and established parties … progressively fading away, thus enabling the emergence of new parties and/or new agencies for the aggregation of demands’. Social and economic change had ‘liberated the citizen’, and encouraged ‘self-affirmation (as opposed to group solidarity)’ so voting was ‘no longer the confirmation of ‘belonging’ to a specific social group but becomes an individual choice (not necessarily a rational one), an affirmation of a personal value system: the ‘issue voter’ tends to replace the traditional ‘party identification voter’. ‘During the past three decades, a growing share of the publics of high-income countries has experienced declining real income and job security, in context with a large flow of immigrants. This has fueled support for xenophobic populist authoritarian movements such as British exit from the European Union, France’s National Front and Donald Trump’s rise to power. The Silent Revolution dynamic is still at work, but it is now moving in reverse’. The two ‘mega period effects’ are cultural change and in particular immigration, and deteriorating real economic prospects for many people. 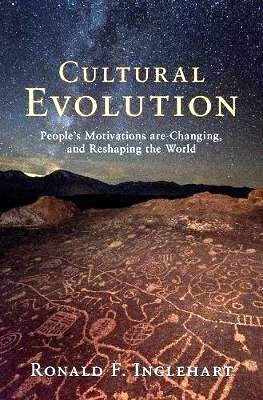 The same phenomenon of response to a perception of rapid cultural change has been described by Karen Stenner in The Authoritarian Dynamic, Jonathan Haidt and Eric Kaufmann. Both these effects are susceptible to political intervention. For example in the UK, the current delivery mechanisms of government policy on resettlement of aslum seekers and refugees leads to them mostly being sent to poorer areas, which are already stressed by multiple disadvantages causing insecurity. In these areas job prospects are usually worse than in richer areas and social housing is inadequate, and the so the very communities most likely to experience an authoritarian response are also being challenged to accommodate cultural change. (Of course most immigrants are not refugees but policy influences often have similar effects for them too). Economic growth has continued since 1975, but in high-income countries virtually all of the gains have gone to those at the top … Cultural backlash explains why given individuals support xenophobic populist authoritarian movements– but declining existential security explains why support for these movements is greater now than it was thirty years ago. His new book Cultural Backlash: Trump Brexit and Authoritarian Populism written with Pippa Norris, has now been published. Inglehart says it show that this effect ‘explains the rise of Authoritarian Populist parties in dozens of other countries’. In other words, that immigration/cultural change combines with economic factors which undermine the sense of security and achievement (relative not absolute), to drive an increase in ‘materialist’ values and support for authoritarian populist options. Both the ‘left’ and the ‘right’ need to address the problem of inequalities of opportunity and outcomes between values groups, not just between socio-economic, ethnic, geographic or other divisions traditionally identified in ‘old politics’. Feelings of unfairness and injustice which coincide with values differences are deeper, more easily polarised and harder to de-escalate than those which cross values differences. Unfortunately the Remain-Leave divide shows signs of having become just one such, hence the deep sense of unfairness between Remainers who see the referendum as a case of mis-selling by Leave and so illegitimate, and Leavers who see Parliamentary failure to deliver the Brexit they ‘expected’, as a betrayal. These issues of insecurity intersecting with values differences aren’t going away any time soon and won’t just affect the poorest and the traditional ‘working class’. Inglehart goes on to argue that unless checked by policy, the experience of lost job security will soon extend to almost everyone outside the very rich, due to fundamental changes in how economies work. It has already been driven by the rise of the knowledge economy (favouring the educated), and is now being propelled by automation but will increasingly be caused by the spread of AI, which promises to replace humans in ‘judgement’ and professional roles ranging from medicine to the law. My next blog will focus on the rise and fall of David Cameron’s green experiment at the hands of British Conservatives Euro- and Climate-sceptics who went on to bring about Brexit, and the role played by values.